One weekend Mac came to visit us and we started playing Monopoly. Gramps’ playing piece was the hat, mine was the thimble and Mac’s was the car. The game lasted from one day to the next, as it often does. 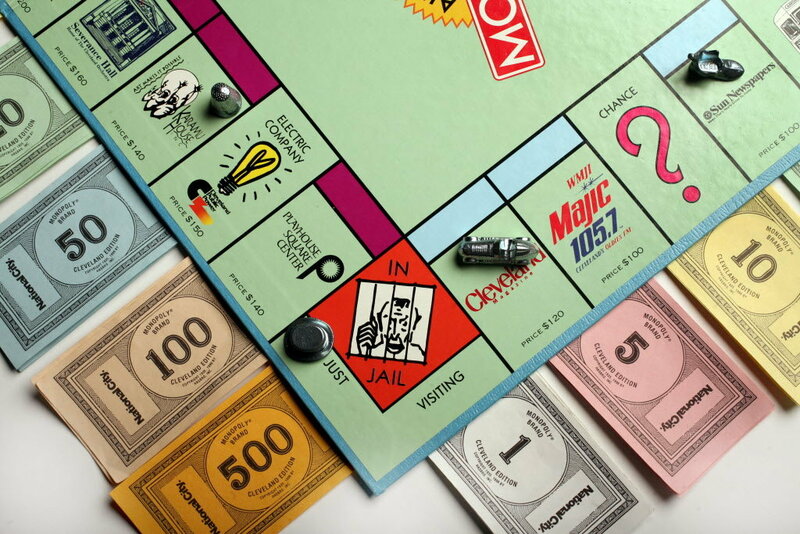 It was becoming clear that Gramps was going to win, as he had all the hotels and houses. Whoever landed on one of his properties next was going to go bankrupt. Mac sat up straight and announced, “I’m going to sell my car!” and promptly traded his playing piece in for the horse. Gramps tried to convince him that the maintenance cost of a horse would probably be more than the car, but Mac was convinced his luck would change. Gramps, of course, won royally, but what a laugh we had! 1 – Love Unconditionally. Let them know they are the light of your life. Always end the conversation with “I love you”. Tell them often how much they mean to you. 2 – Cheer them on. Not just at soccer or baseball games, but always tell them they can do it. Give them encouragement. Always be on their side and help them to believe in themselves. 3 – Laugh. See the funny side of life. Tell jokes and laugh at their jokes. Use humor to heal the heart. 4 – Hug. Make physical contact when appropriate. Give a good hug and kiss. Sit close and snuggle. Hold hands when walking. 5 – Move as much as you can. Keep active and do it with the grandkids. Walk. Ride bikes. Swim. Hike. Camp. Go fishing. Garden. Dance. Anything done with a child can be fun! 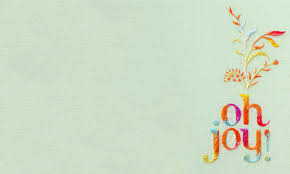 6 – Enjoy life. Don’t be a hermit. Be active in the world. See friends. Go to movies and plays. Listen to music. Go to the library. Join a club. Be active in church. Meet your neighbors. 7 – Be positive. Keep a good attitude. Don’t complain. Change the things you don’t like and adjust to the things you can’t change. Be an optimist. 8 – Have a hobby. Keep busy. Have a passion and an interest. It gives you something to talk about! 9 – Forgive. Set a good example and let go of the wrongs done to you. Learn to say “I’m sorry” also. 10 – Always greet them with a smile. 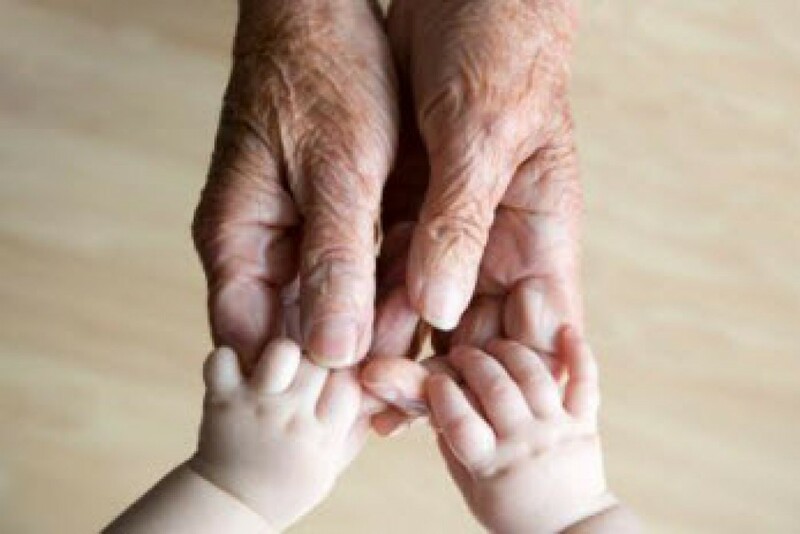 Make your grandchildren feel as though you have been waiting for only them. Always always greet with a smile. Tell them how glad you are to see them. The Joy Of A Good Brrr! Here we are in Texas having one of the colder winters in memory. Trying to stay warm has become a full-time job for most of us, Gramps and Granny included. There is whining and sniveling going on in all corners and everyone seems to be wishing for summer to come now, not later. Granted, we are not shoveling our way out of mounds of packed snow or dealing with subzero temperatures, but a little ice and sleet go a long way here in the new Old West. And believe me, we can complain about the weather better than most. But in the midst of all this misery, I have tried to see the joy and wonder of it all. 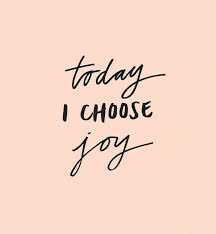 Most of the time I feel as though I’m swimming upstream by myself, but I am determined to make this my year of joy. So I share with you the happiness of cold that I have discovered. 1 – The joy of winter clothes. I love the feel of sweaters and sweatshirts. Adding scarves is very fashionable now. Fancy socks have become my new passion and joy. Wearing my fuzzy slippers around the house is a real hoot! 2 – The joy of winter foods. I love soups and chili and stews with bread and wine. I love pot roast. I love holiday fare with warm pie ala mode. I love hot apple cider. 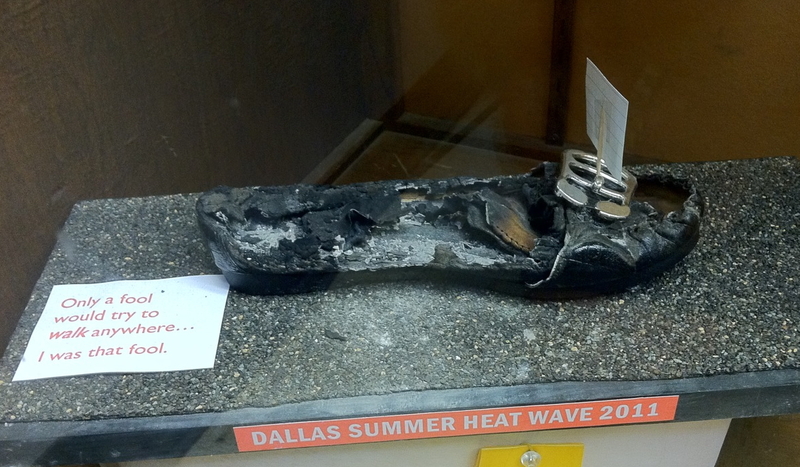 3 – The joy of fires in the fireplace. Gramps and I have one every evening on these cold days. Very cozy and romantic! And our new house has a gas starter, which makes it so easy for Gramps. 4 – The joy of Winter Olympics. Love the skating, the skiing, the snowboarding, the luge. Love the whole thing – all of it – from the opening flame lighting to the closing ceremony. 5 – The joy of the cat. I adore having our new kitten Oreo sleep on my lap, purring and providing lots of furry warmth on a cold day. We even take naps together! How wonderful is that!! 6 – The joy of cuddling. Gramps and I tend to sit closer together on a wintery day. We hold hands to keep warm when walking outdoors. And who can say no to a warm snuggly hug? 7 – The joy of candlelight. With these early sunsets and more darkness in the evenings, I use candles more often. I love the look, the feel and the aroma of candles. Sometimes we turn out all the electric lights and just use the fireplace and some candles. What ambience! 8 – The joy of indoors. When grandkids come over and it is too cold for outside fun, we must rely on inside activities. 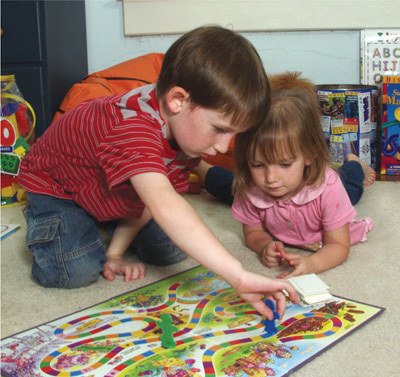 We love board games, puzzles, reading, old movies, new 3D movies, cooking and crafts. Indoors can be as fun as outdoors. 9 – The joy of sightseeing. How about a family slide show or movie night? Or a road trip without getting out of the car? Can’t be beat, really. So no more whining and moaning for me. I’m having a grand time in this chilly month. I’m finding the joy in the cold! Brrr!!!! 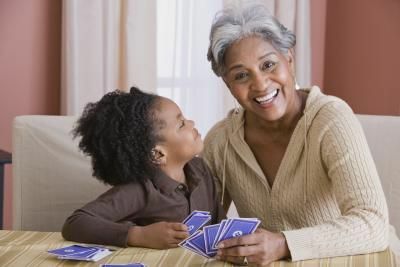 How many times have I heard those words from a sweet grandchild with pleading eyes, pursed lips and a toy or a game in their outstretched arms? Plenty, I tell you, and also not enough! Spending time with a little one has to be one of the greatest pleasures in the world. And when that time is face-to-face in imaginary play, the gates of heaven themselves seem to open up. It is great fun in the moment and the memory is beyond words. Our 7 yo grandson Mark has always enjoyed games but recently has discovered a new level of board games that we have all been rediscovering with him. Checkers has become a real favorite, along with “The Ladybug Game.” It requires no reading, and was created by a first-grader as a school project. Mark was very intrigued by this and has decided he could do something similar. Such an interesting way that a game can be inspiring! Another new favorite is “Qwirkle,” which is similar to Dominoes. Planning and strategy are necessary, so both of us are learning some new skills here. Games and the time spent playing them can teach kids so much. And how to win is the least! In the beginning it may be just about taking turns and having fun. Later on, there’s much to absorb about fairness, truth, strategy, planning and having fun. Eventually, one must learn how to lose with grace, prepare for the future, visualize the effects of one’s actions, help others to succeed and have even more fun. The lessons of game-playing, as in life, never seem to end. And neither does the joy, thank heavens! As I was cleaning out a closet recently, I found our old “Monopoly” game with a record of all the winning scores on the inside of the box lid going back more than thirty years. One particularly lengthy and sweet entry: 2/10/1986, my son’s name (he was then about 12 years old), $11,860, the town where we lived in Texas, 10:45 AM, 8 hotels, 6 houses, 18 properties, happened on a snowy day. I can picture in my mind the kids home from school on a snow day, a fire in the fireplace, hot cocoa in mugs and everyone playing Monopoly for days at a time, stopping only to eat. The youngest child succeeding and proudly writing his legacy on the lid of a game box. There to be found, read and wonderfully remembered by his mother thirty years later. Don’t think for one minute that time spent playing with your youngster is time wasted. It is profound. It is necessary. It is gobs of fun. Want to spend a wonderful day with your grandchildren? Try taking them to your local fair. This is the time of year for State Fairs, Harvest Fairs, Autumn Fairs, you name it. A day at the fair is the thing to do. 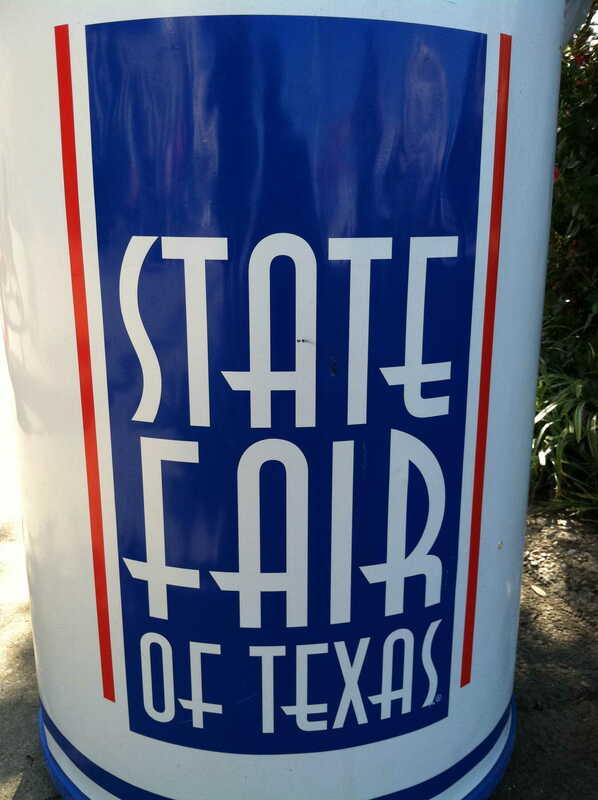 Gramps and I recently spent the day at the Texas State Fair so I could show you all the fun you and your little ones could have. 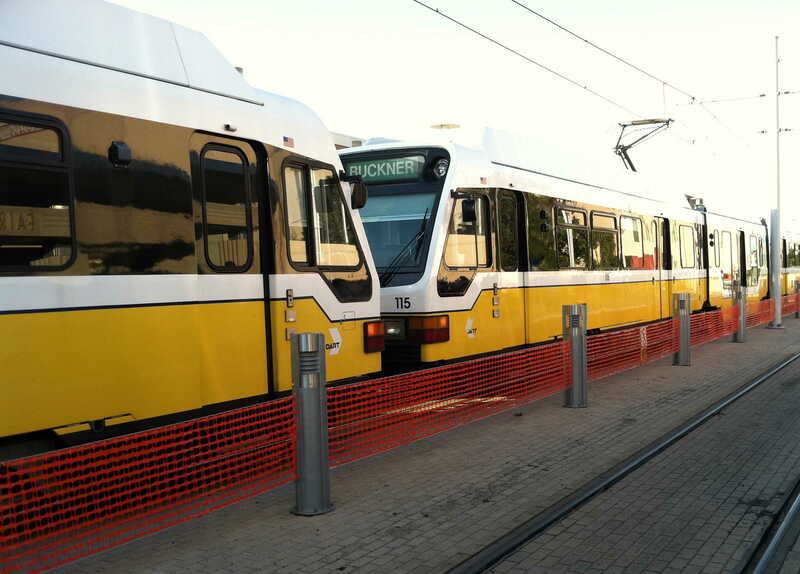 First of all, we parked our car and took the DART train into Dallas. Don’t forget – HOW you get there is part of the fun! What child (or adult for that matter!) doesn’t love a train ride? We saw some interesting sights, like construction areas with cranes, bulldozers and dump trucks. That’s like finding treasure for little boys!. The train was elevated in spots, so we were “on top of the world.” We even went through a tunnel, making it about the most perfect train ride ever! All that fun and we hadn’t even gotten to the fair yet! 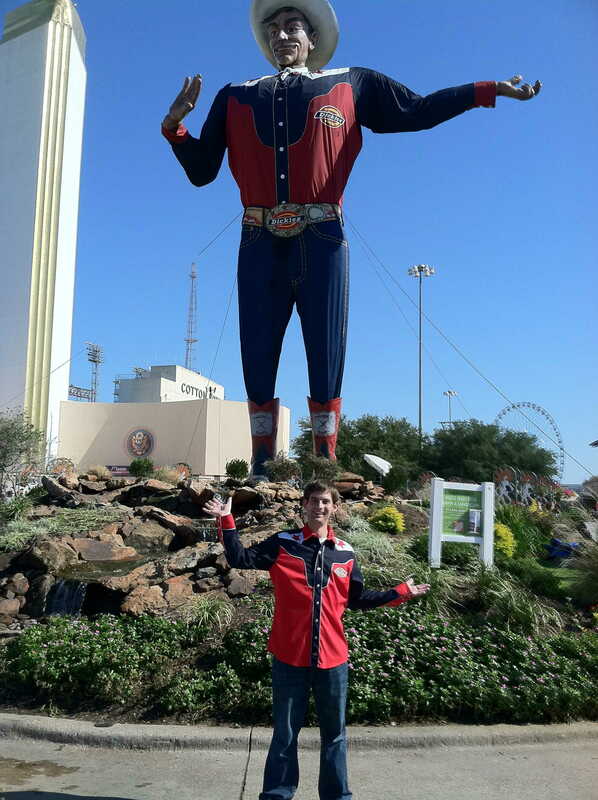 Arriving at the fairgrounds, we were met with colorful flags, water fountains and of course, Big Tex. He’s a fixture in Texas and he used to talk with a deep voice welcoming everyone in. Now he just greets fairgoers with his immense height, size 50 boots and 100 gallon hat. It is not required that you dress like Tex, as this gentleman has, but “dressing for the fair” is appropriate. You will be out in the sun and doing a lot of walking. Exchanging money for coupons is the first order of business. You can’t do anything without your coupons. HINT: Keep a few coupons for souvenirs for that scrapbook page, along with the train tickets. Makes beautiful memories for all! 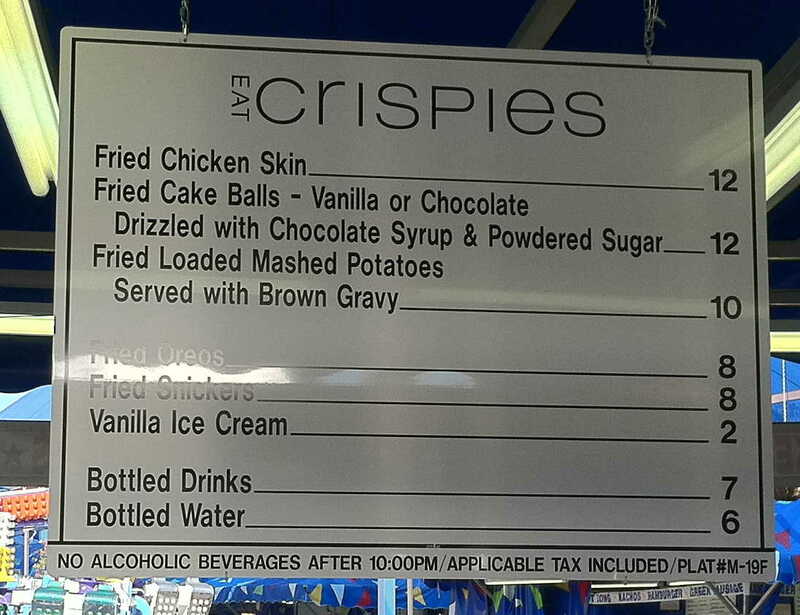 Now, on to food – fair food – bad fair food. Is there any other kind? No day at the fair can be enjoyed or remembered properly without good bad fair food. I have to say I used to think funnel cake was just about the baddest of fair food. But no more! Try fried butter, fried OREO, fried pizza, fried Snickers, fried______ (fill in the blank). And this, fried PBJ &B. What is that, you ask? A fried peanut butter, jelly and banana sandwich, which for some strange reason, looked kind of tasty to me. Scary! The menu boards alone were a source of so much hilarity to me, I wanted pictures of them all! I was laughing. Kids were laughing. Even food servers were laughing. Where have I been, I wonder? Oh, that’s right – the fat free aisle! After lunch, it was over to the car show for the boys (big and little). 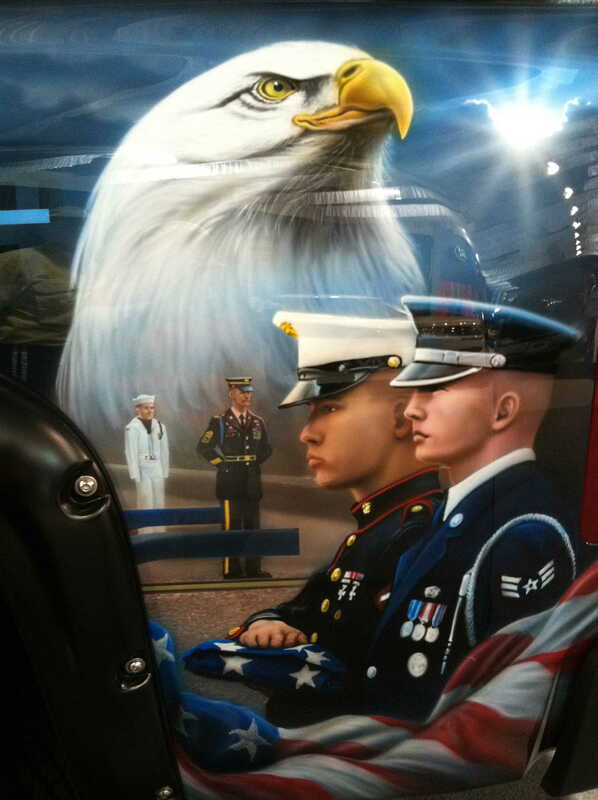 There was a spectacular truck with a special paint job in memory of 9-11-01. Those old enough to remember were somber and respectful. Those too young to know were quietly told the story and meaning of all the vignettes covering the truck. It was a special moment and a great time to share and reflect a pivotal happening in all of our lives. What a great way to memorialize and pass on to the next generations a day we can and should never forget! Next, we visited the crafts, textiles and foods, which was basically quilts, canned foods, pies, cakes and oh yeah, the LIFE-SIZED BUTTER SCULPTURES! 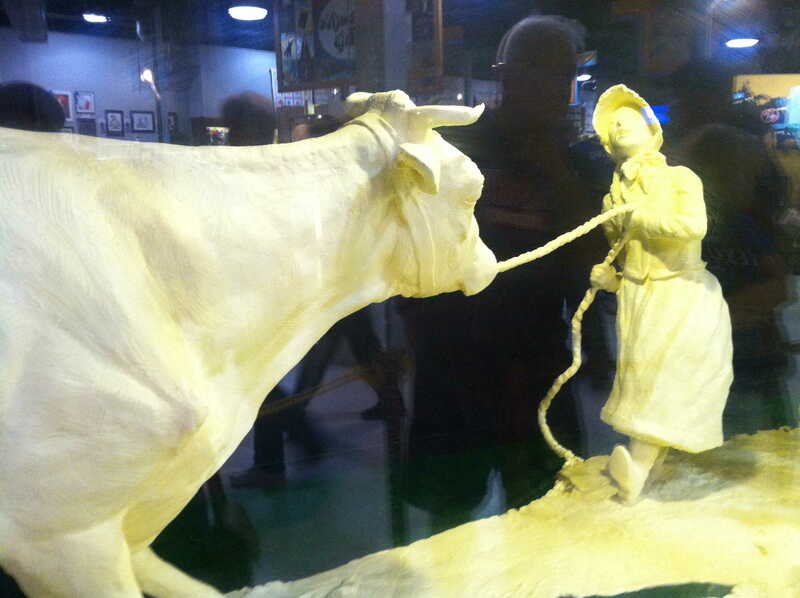 Really, could anything impress a child more than a life-size cow made out of butter? I don’t think so! Well . . . . . . . there was the shoe collection . . . . . . . pretty funny, huh? HINT: I was thinking this could be a great thing to do at home with the kids. Another Granny Camp activity! What fun! Just be sure you use “old” shoes. And what fun would a fair be without animals? 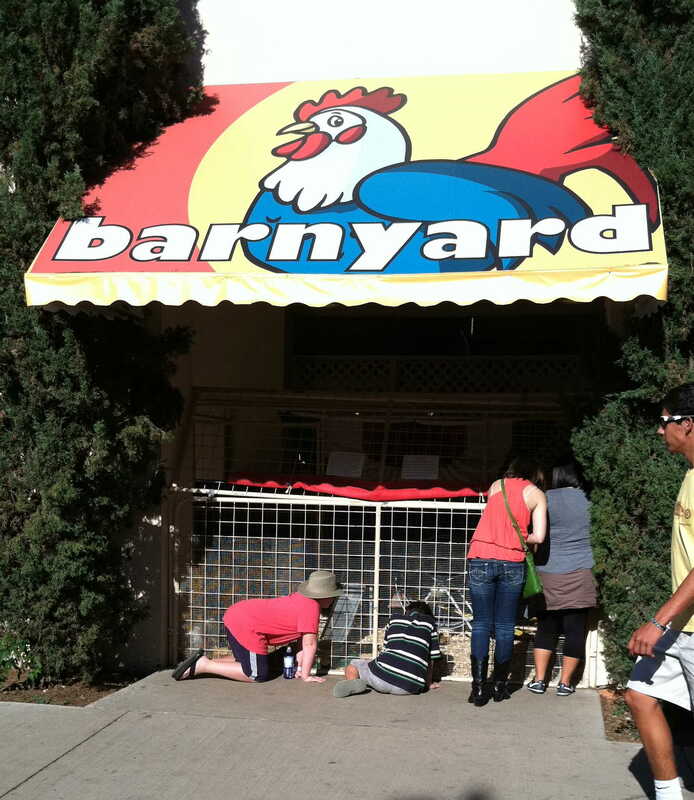 Be sure you get to the barnyard, petting zoo, pig races, dog show and any other show of your favorite animal. Kids and animals just naturally go together, that’s a fact! Now, for the Midway. Games, rides, feats of strength and accuracy or just people watching. It’s all there. Families of every size, shape and hue can be found. So take the whole group – youngest to oldest – from stroller to wheelchair and make it a true family day. Go on the rides and win a stuffed animal. That’s what the fair is all about – having and sharing the fun! 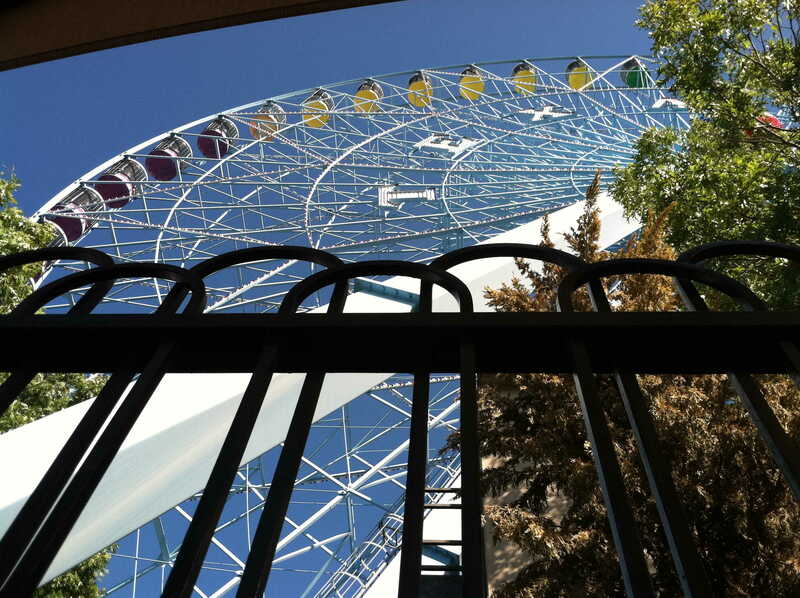 Gramps and I took a spin on the ferris wheel, The Texas Star, another state icon. We shared the cabin with sweet Mia and her mother. 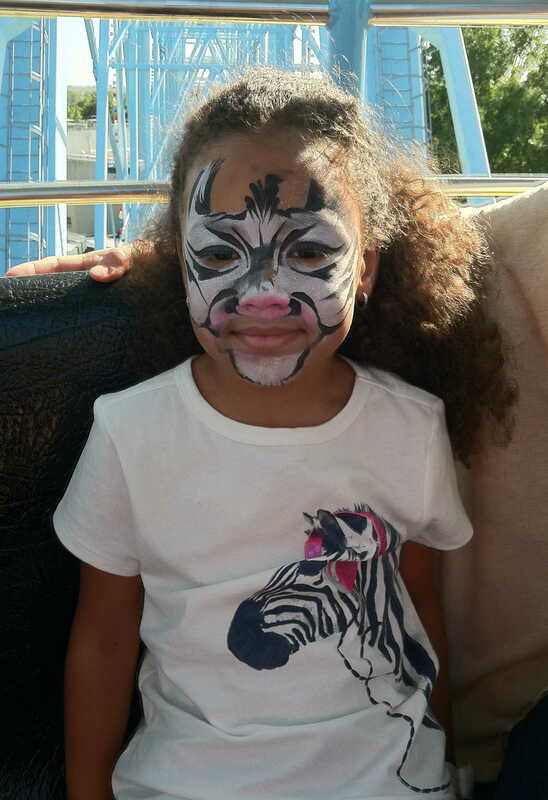 Mia looked lovely with her face painted in “zebra” to match her shirt. I so love a girl who is color coordinated! 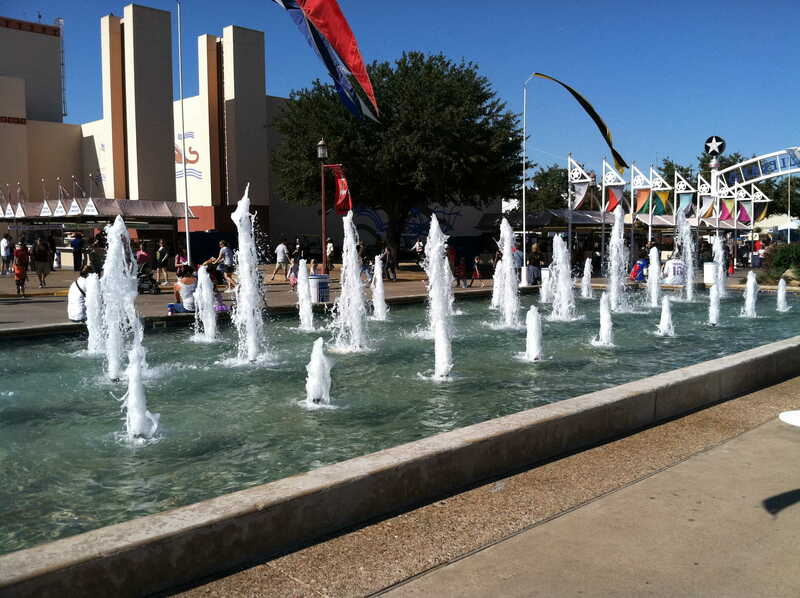 Depending on your endurance and how many children you have in tow, you can add attractions to your day.Stay late for the concert and the laserlight water show, shop the vendor stalls, get a massage, have your shoes shined (Yes, even your sneakers! 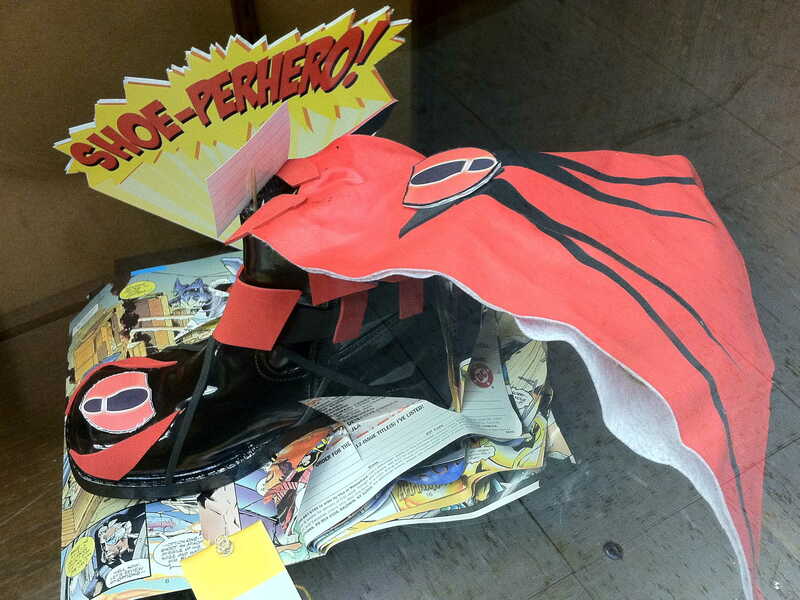 Yes, even your kid’s sneakers! ), walk through a house carved out of 1 Redwood log . . . . . the list goes on. But the day came to a close. So back on the train we went, up in the air, through the tunnel and to our parked car. Exhausted, stuffed, dusty, happy, with a camera full of pictures and a heart full of memories, we ended our day at the Texas State Fair. Hard to believe it was only one day. But remember, my Sweeties, it only takes a moment to make a lasting impression on a child.